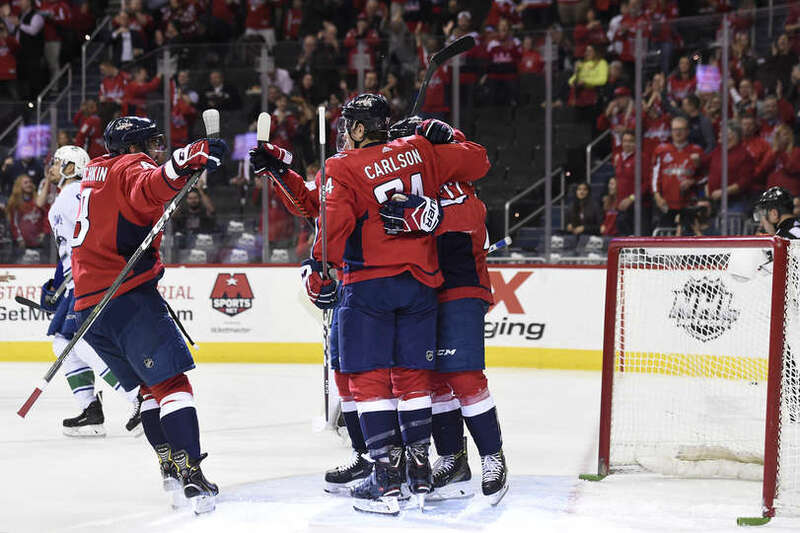 The Washington Capitals beat the Vancouver Canucks 3-2 Tuesday night at Capital One Arena. The win improves the Capitals record to 29-18-6 (64 points) on the season. The Capitals continue their six-game homestand on Thursday when they host Philipp Grubauer and the Colorado Avalanche on Salute To Military Night. Puck drop is set for 7:00 PM. The Capitals opened the scoring with a tally from T.J. Oshie just three minutes into the contest, giving the Capitals a 1-0 lead at the first intermission. After a scoreless middle frame, Brett Connolly stretched the Capitals lead to 2-0 early in the third period, but the Canucks quickly answered to cut the Caps lead to a goal. Jakub Vrana would restore the Capitals two-goal lead at 12:13 of the final frame. The Canucks would close the gap to one with 7.6 seconds left, making it 3-2, but that would be the final. Scratches: Madison Bowey, Nic Dowd and Chandler Stephenson were the healthy scratches. Christian Djoos was assigned to Hershey for LTIR conditioning. The Capitals would strike first with a goal from T.J. Oshie at 3:00 into the first frame. Nicklas Backstrom and Alex Ovechkin were credited with the helpers. With the assist, Ovechkin set the all-time points record for a Russian player in the NHL. And that would be all of the scoring in the first 20 minutes. The Capitals out-attempted the Canucks 17-10 in the first period, and led in shots on goal (SOG) 18-5. Both teams were 0 for 1 on the man advantage. The second period would go scoreless. Braden Holtby would stymie a Canucks penalty shot midway through the period, and make several additional strong saves to maintain the Capitals 1-0 lead. The Canucks out-attempted the Capitals 19-8 and led 13-4 in SOG in the middle frame. The Canucks out-attempted the Capitals 29-25, but the Capitals led 22-18 in SOG after two periods of play. The Capitals would stretch their lead to 2-0 with a goal from Brett Connolly at 5:47 0f the final frame. Evgeny Kuznetsov and Jakub Vrana were credited with the assists. This was Connolly’s first goal in 13 games. But the Canucks would quickly answer. Markus Granlund would notch the first tally for Vancouver at 8:02, making it 2-1. The Capitals would restore the two-goal lead with a tally from Jakub Vrana at 12:13 of the third period. The Canucks would add a late goal to make it a 3-2 final. The Capitals’ 18 shots in the first period is the most shots they’ve recorded in an opening period this season, the most they’ve recorded in one period at home and one shy of their single period high this year (19, Jan. 23 at Toronto). Alex Ovechkin has recorded his 1,180th career point (644g, 536a), passing Sergei Fedorov to become the NHL’s all-time leading Russian scorer. Braden Holtby stops Bo Horvat on the penalty shot. Holtby last stopped a penalty shot at home on Nov. 3, 2018 (Dallas’ Tyler Seguin), and Holtby hasn’t allowed a penalty shot at home since March 5, 2013 (Boston’s Brad Marchand). With tonight’s win, the Capitals have moved into second place in the Metropolitan Division. This entry was posted in News and tagged Brett Connolly, Jakub Vrana, Jay Beagle, Jon Sorensen, T.J. Oshie, Vancouver Canucks, Washington Capitals. Bookmark the permalink. HOw good was JS last night? What to do now the CJ is ready? I thought Siggy was a bit shaky last night. Djoos will play for Bears in Springfield Wednesday night, then return to Washington. Another game where the team did not play sixty minute hockey. Eighteen shots during the first period and then they decided to stop shooting the puck on net. Holtby saved their bacon once again. Not happy in their style of play at the moment. Their not paying attention to those little details that are so important to make another championship run. Is it the players or the coaching? Moments of championship-caliber hockey, last night.